Russell and Kitty here. Happy Stretch Glass Tuesday! Hope you had a good 4th of July celebration. When the pattern “Big Cookies” is mentioned, the non-iridized #1681 – 10 1/2″ Handled Basket or even the #1681 – 7″ Macaroon Jar comes to mind. The “Big Cookie” pattern was popular in the early 1930’s as William Heacock in the book Fenton Glass the Second Twenty-Five Years lists the pattern as being made in 1933. Don’t ask us why the 7″ Macaroon Jar is called a ‘macaroon' jar and not a cookie jar. Maybe macaroons were popular in the 1930's. The other reason maybe that the name “Big Cookies” cookie jar would be confusing to buyers as well as a tongue twister. Try saying Big Cookies cookie jar three times fast! The Persian Pearl (white) Big Cookies Basket is not mentioned in any of the references that we have. Nor is it listed in clear (non iridized) white or amber glass. 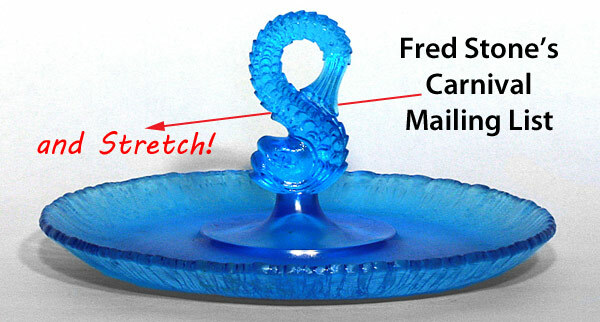 But Big Cookie's pattern was made in all of the popular lines of Fenton glass of the period. Fenton made very little amber glass in iridescent stretch glass. When the depression of the 1930's in the United States hit, people just didn’t have the money to buy pretty glass; the glass that people purchased was to be used. Also people were tired of iridescent glass. 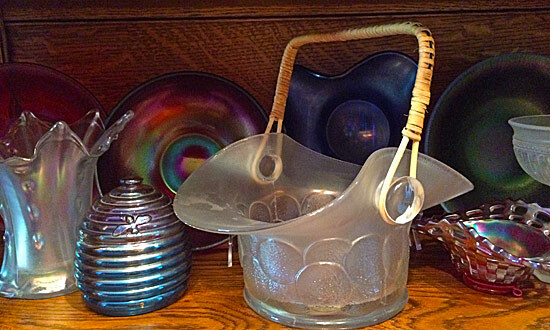 What we surmise is that the two baskets were made as prototypes right before the depression hit the glass industry. 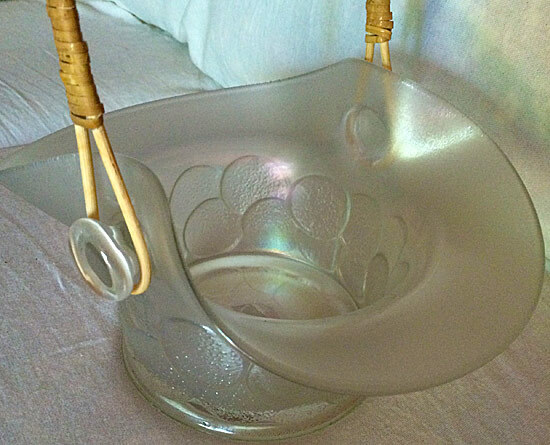 But being thrifty as molds were expensive, they used the molds for the new lines of glass made during the depression. 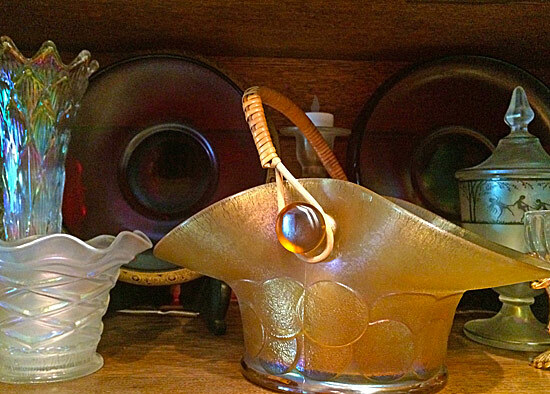 Many of the experimental pieces of Fenton glass were put into the Fenton Museum. 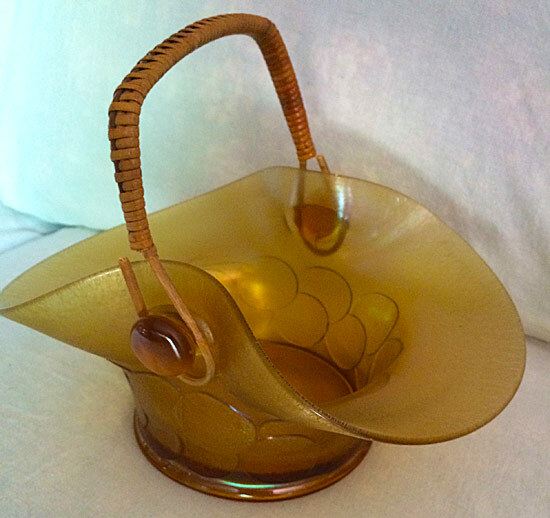 The amber stretch glass Big Cookies basket was from the Fenton Museum. It was sad to see the Fenton Museum Glass sold to people around the world. As collectors we are very pleased to have pieces from the Fenton Museum, but it was a learning experience to tour the Museum and see what the Fenton Company produced in their lines as well as the experimental pieces. Does anyone have any of the iridescent stretch glass pieces or even iridescent Big Cookies baskets or Macaroon Jars? If so, what color? Also do you use the baskets for arm curls to firm up the arms? Yes, they are heavy pieces of glass, 3 lbs. and 4 oz. with the bamboo handle! Don’t forget to make your reservations for the Stretch Glass Society Convention. Put July 27-29, 2016 on your calendars so you can attend the SGS Convention in Marietta, OH. Hope to see everyone in Marietta, Ohio!! !